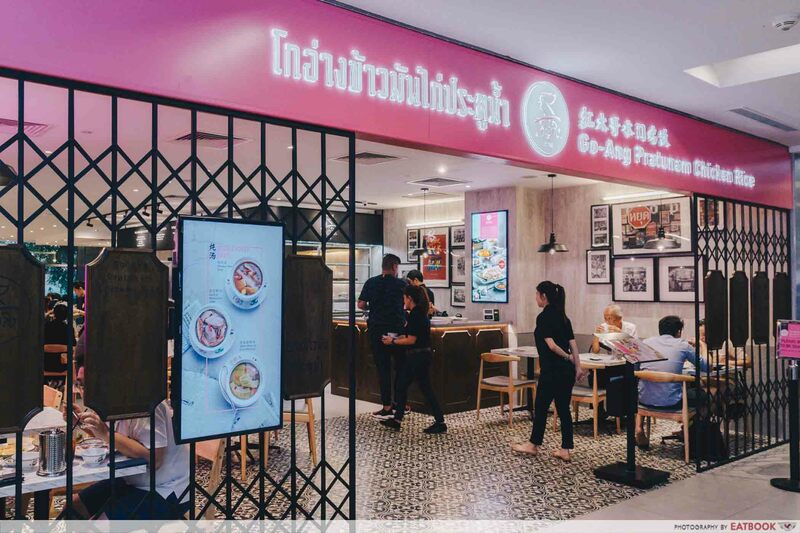 When I’m in Bangkok, I never had the patience to join the interminable queue for a plate of award-winning chicken rice from Go-Ang Pratunam Chicken Rice. All I had on my mind was to shop till I drop. 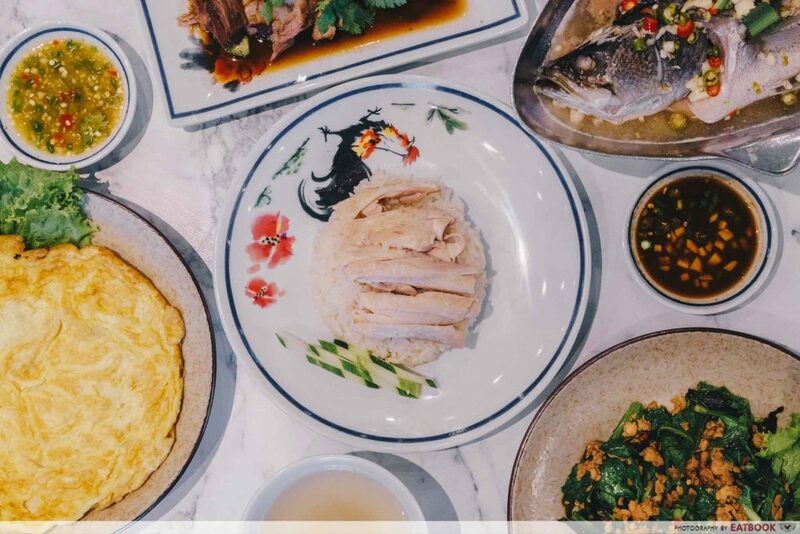 Here’s a good news for die-hard Pratunam Market shoppers like myself – Bangkok’s famous chicken rice is now here in Singapore. 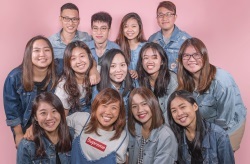 Located at basement one of Nex beside Koi, the store replaces ThaiExpress. A plate in Bangkok will set you back THB40 (~S$1.68), but a Single Portion Chicken here costs $4.50++ for breast meat, and $5.50++ for the thigh. 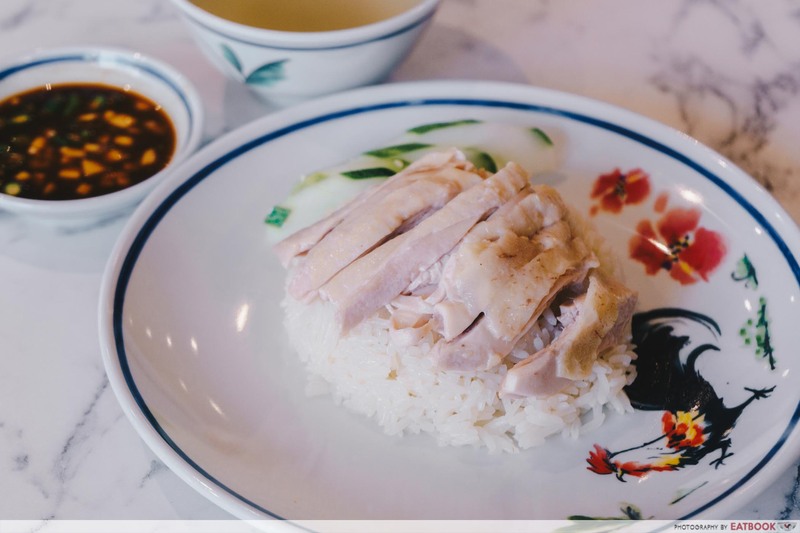 Served exactly the same way in Bangkok, you get poached chicken and cucumber slices atop a mountain of fragrant rice, along with chicken soup and their signature dark sauce. Three main elements make up this dish: chicken, rice, and chilli. The star of the classic trio was definitely the chicken thigh. The chicken breast was a tad too dry and I would definitely top up $1++ to get it changed to thigh meat instead. It ticked all the boxes of my dream poached chicken. The meat was tender and juicy, and the shiny sliver of chicken skin exploded with flavour. The dark-coloured chilli sauce came in a close second. Simply addictive, it was rich with umami flavours from a family recipe of fermented chilli, fermented soy bean, ginger, and sugar. Its deep and strong flavours, along with clean and light fragrance from the chicken, were a match made in heaven. The rice tastes slightly different from the oily grains we are more used to. Here, the rice was on the drier side, and the taste of shallots were stronger. 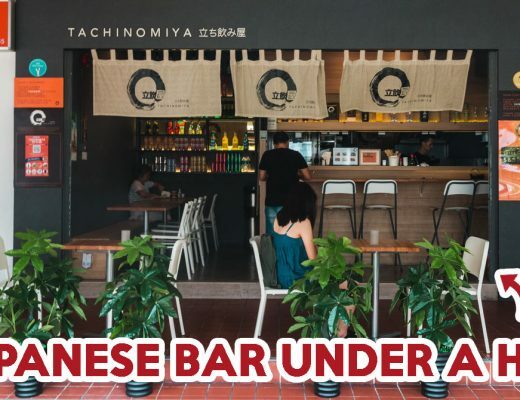 Aside from chicken rice, they also have an extensive menu featuring other Thai dishes. My favourite was their Stir Fried Basil Chicken with Kai Lan ($8++). The Thai basil lent an aromatic earthiness to the crunchy kai lan. Its exotic and mellow fragrance makes it easy to finish this with a simple bowl of white rice. 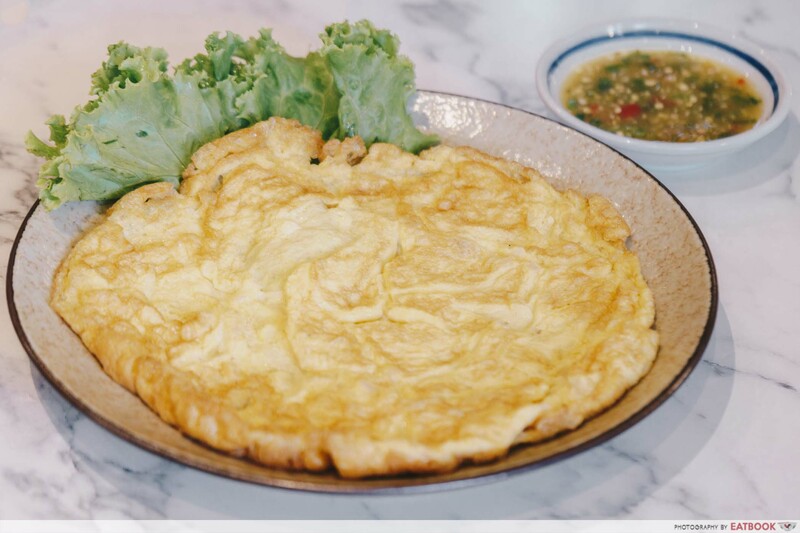 When having Thai food, a good ol’ omelette is a must-order for me. However, the Chai Poh Omelette ($6.50++) here was nothing to shout about. I could barely taste or even see the chai poh bits. The only saving grace was the dipping sauce which was sour and spicy. I suggest giving it a miss. Order another plate of chicken rice instead. 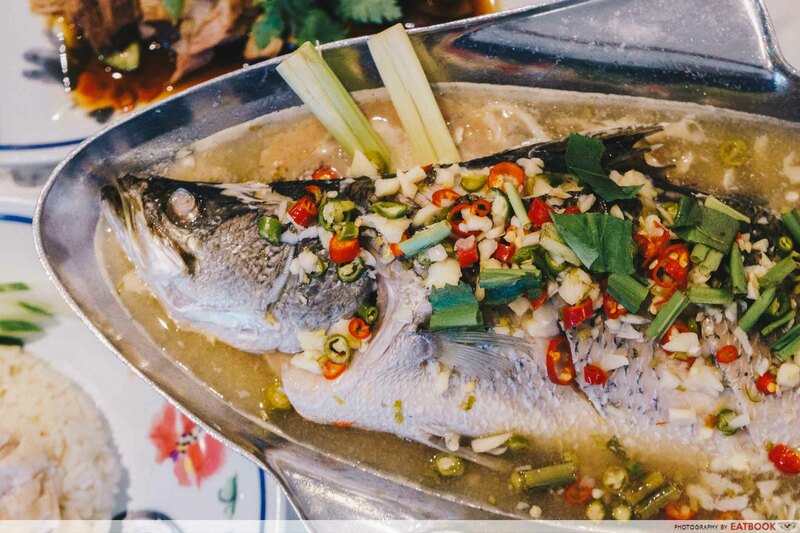 If you have extra cash to splash, definitely order their Steamed Sea Bass with Chilli, Lime & Garlic ($28++). It was a whole hodgepodge of flavours that charmed everyone at the table. Thai cuisine thrives on mingling contrasting flavours into harmony, and this dish was just that. 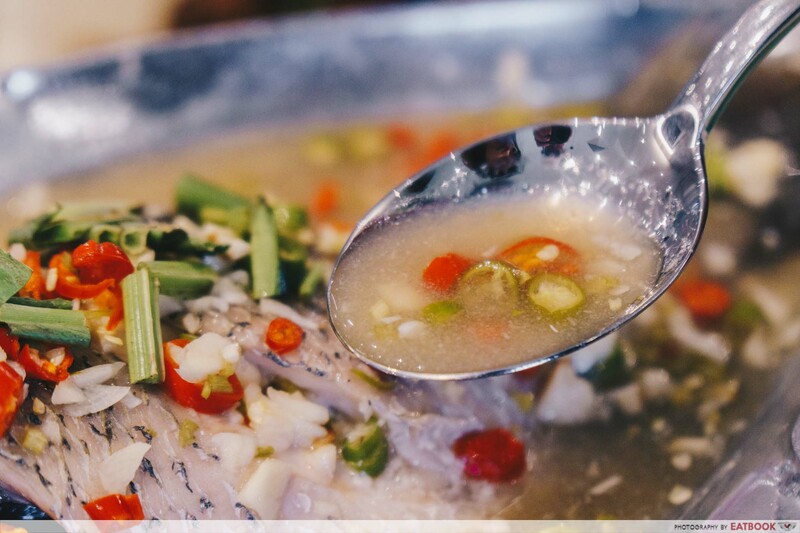 The delicate fish was sweet, spicy, and refreshingly sour all at the same time. The broth was so tasty you’ll be thinking about it all week. Coupled with green and red chilli padi, and a dash of lime juice, it packs a mean punch. Be careful to leave the chilli padi alone or suffer a fiery death. 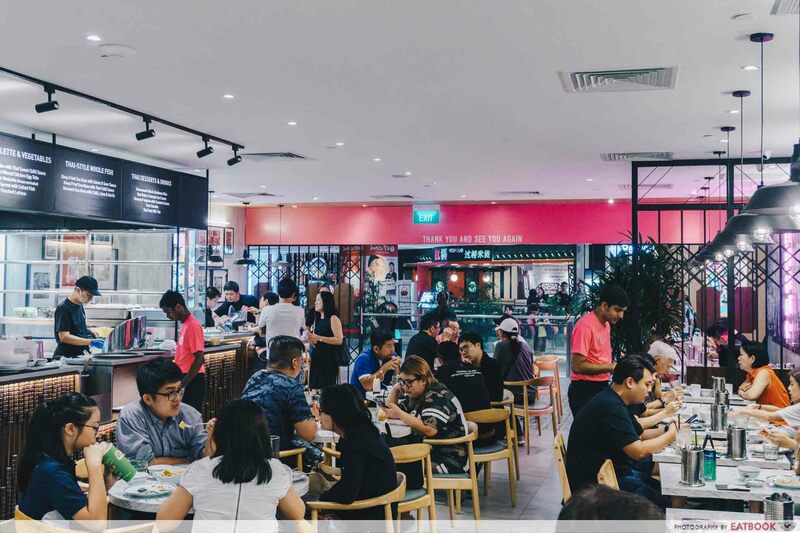 The outlet at Nex is a stark contrast to the outlet in Bangkok. 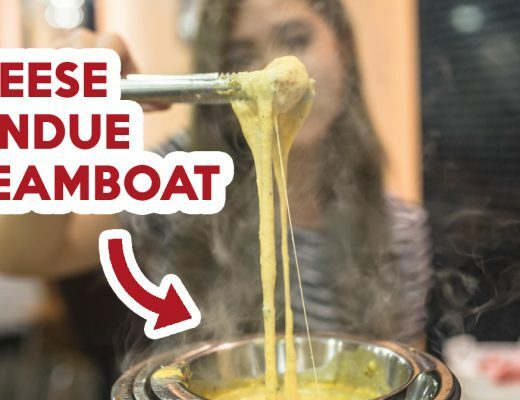 They might have lost the gritty charm of Thai street food, since it is an air-conditioned eatery, but you can still watch the kitchen hum with activity like a well-oiled machine. Despite the crowd during mealtimes, they were nicely equipped with fast servers and enough seats to keep it going. This is a plate of chicken rice that can’t go wrong when you’re in Nex. Eating here can be budgeted at around $10 a head. 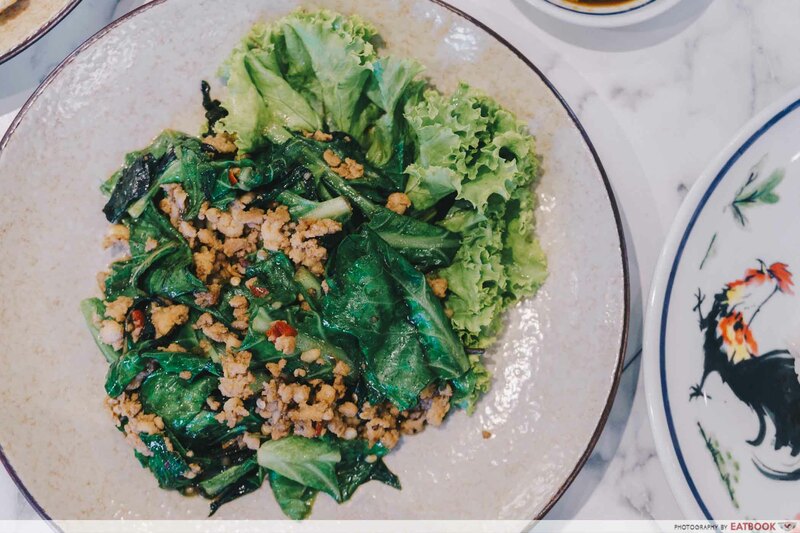 Tasting like a carefully prepared home-cooked meal, Go-Ang Pratunam Chicken Rice is a great place to bring your family to, especially if you’re looking to switch up from the usual zi char haunts. 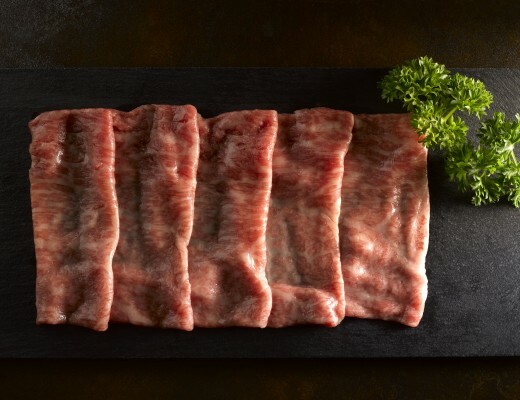 For more Michelin-mentioned eateries that have arrived on our shores, check out Konjiki Hototogisu and Tsuta! 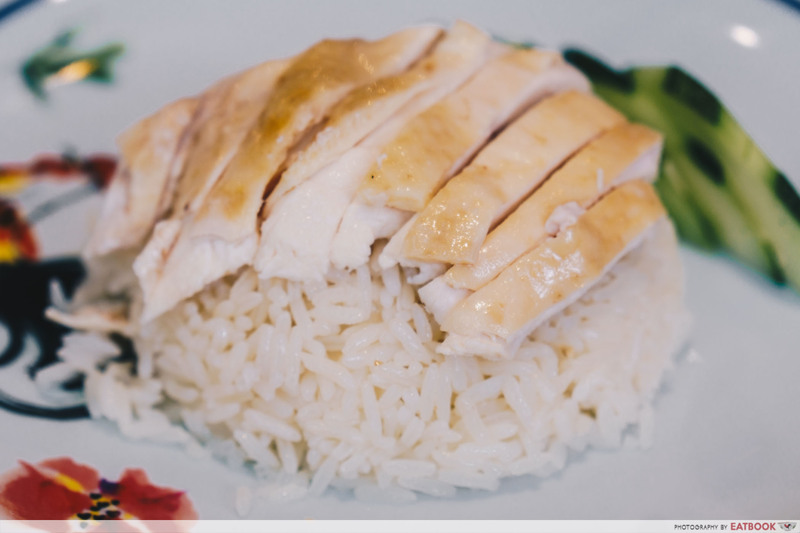 Go-Ang Pratunam Chicken Rice is not a halal eatery. This was a media tasting at Go-Ang Pratunam Chicken Rice.